this site, and in microscopy in general. an advanced illumination system which uses a lens under the stage that would typically move in the vertical direction. It would usually also have an adjustable iris to control the beam diameter of the light prior to entering the lens. By adjusting the iris opening and the lens distance from the target, the user has very good control over the amount of light and its focal point. Usually found on the more advanced microscope systems and very useful at higher magnifications (400X and above). a lens specially designed and coated to correct for the tendency of light to separate into colors when passing through glass. An achromatic lens corrects this such that colors are more accurate after being magnified. A compound microscope with two eyepieces viewing down a single optical channel and objective. This is different than a stereo microscope, which has a separate optical channel for each eye. Click here for an example. a.k.a. C/CS-mount, is a threaded standard developed for mounting a lens to a camera. Most commonly used for video cameras (i.e., CCTV cameras, not camcorders), and is used to mount cameras to microscopes. The mechanical definition of both standards is 1" diameter, 32 TPI (threads per inch), male on the lens (or microscope) side and female on the camera side. The optical definition of the C-mount is that the image reaches the focal plane, or camera's detector, at 17.5mm past the edge of the lens' (or microscope's) mounting threads. The CS-mount is identical in all respects except the focal plane is 12.5mm past the mounting threads. A CS-mount camera can be mounted on a C-mount lens or microscope by using a 5mm extension ring. See also: T-mount. A configuration where one knob is centered on top of another. For example, coarse and fine focus may have a larger coarse focus knob with a fine focus knob on top of it (so the center of both knobs is on the same axis). Also commonly used for Mechanical Stage X/Y movement knobs. Literally a microscope with multiple lenses, however that describes virtually all modern microscopes. It has come to refer to the high-powered microscope such as that pictured at the top of this page used for viewing cells, bacteria, etc. It would typically include multiple user-selectable objective lenses of varying magnifications and present a two-dimensional view. See also: stereo microscope. A microscope with cordless illumination. Typically a L.E.D. system using batteries and can be either 'rechargeable' or 'battery powered'. 'Rechargeable' will include rechargeable batteries (e.g. NiMH) in the microscope's base and an AC battery charger. 'Battery powered' uses standard batteries (e.g. alkaline) and will therefore not include a charger (of course rechargeable batteries can still be used with an optional external charger). Cordless microscopes are great for field work, classrooms where the power is not conveniently distributed, areas where AC power is not reliable, etc. Battery powered microscopes coupled with a solar powered battery charger can be used indefinitely in areas with no AC power. L.E.D. microscopes also typically have a much longer bulb life than other styles of illumination. A microscope and video camera combination with a digital output such as USB or firewire. Often includes software to display the image on a PC. (Deutsches Institut fuer Normung) An international standard which dictates the design compatibility of the objective lens. Therefore DIN standard objectives from one manufacturer can be used in another manufacturer's DIN standard compatible microscope. a lens design that is actually two different lenses cemented together (usually one positive magnifier and one negative). This design is used in widefield eyepieces to obtain significantly better color performance than single lens designs. A monocular microscope with a second, vertical viewing port. The vertical port can be used with an eyepiece for a second person, such as an instructor, to view the specimen, or it can be used with an adapter and a video or still camera. Click here for an example. See also: trinocular microscope. The lens closest to your eye when looking through a microscope. A binocular or stereo microscope will have two, a monocular microscope will have one. It also plays a critical role in the total system magnification. See also widefield eyepiece. The tube into which the eyepiece lens (ocular) is set. This is typically presented at an angle for comfortable viewing such as in the picture at the top of this page. However it may also be mounted in a vertical position such as on a trinocular or dual-view microscope for either a second viewer, or for a camera designed to fit inside an eyetube. Used to indicate the speed in which a video image is refreshed and displayed on a monitor. In video microscopy this is usually controlled by the camera. The faster the refresh rate (number is larger), the "smoother" any movement of the specimen will appear. Distance between the two eyepieces. Typically it is adjustable to accommodate different users. 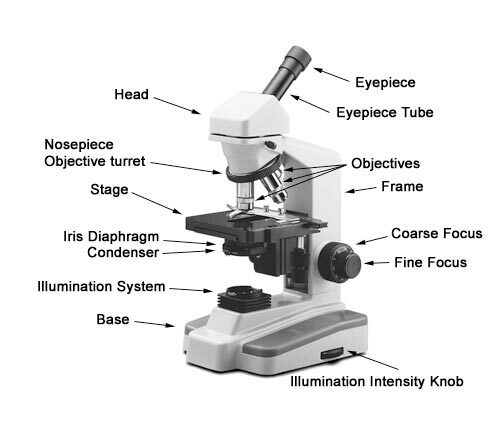 Some microscopes also have graduated scales to indicate the actual distance between the eyepieces, allowing a user to determine the optimum number and then quickly set it before each use. A highly effective illumination design. Please click here for a more detailed definition. A mechanism mounted on top, or as part, of the stage that allows the operator to move the specimen slide in the X or Y direction by turning a knob. Very useful at higher magnifications as it can be difficult to move the slide by hand otherwise since it must be moved such a small amount. Also, moving by hand can be difficult since you must move it in the opposite direction. Most mechanical stages come with a graduated scale so you can see how far the slide has been moved or keep track of the position of various objects on the slide. Please click here for more information. A compound, high power microscope with an illumination system designed to shine light down on the top of the specimen (a.k.a. incident or reflected light). This is unlike a typical biological compound microscope which is designed to illuminate from underneath and up through the specimen (transmitted light). Some metallurgical microscopes will include both types of lighting systems. Reflected lighting is necessary to view opaque specimen such as metal, ceramics, integrated circuits, etc., or any application that requires high magnification of opaque substances. If the application does not require high magnification, then a stereo microscope may be more appropriate. A compound microscope with one eyepiece such as that pictured at the top of this page. The most important lens in a microscope and the one closest to the specimen. In a compound microscope there are usually 3, 4 or 5 objective lenses allowing a selection of magnification levels. For a picture, see "OBJECTIVES" in the illustration at the top of this page. A lens designed to be immersed in oil. A drop of immersion oil is placed on top of the cover glass and the lens is slowly lowered until it rests in the oil. This allows the light to pass through oil rather than air, and at higher magnifications results in a crisper, higher contrast image. A technique using special objectives and condenser system to enhance the contrast of unstained, relatively transparent specimens such as blood and other tissue cells, thereby allowing microscopic viewing of living tissue. It is a sophisticated technique that shifts the light "phase" 1/4 wavelength, causing any light deviated by the specimen to appear dark on a light background. Development of this technique by inventor Frits Zernike earned him a Nobel prize in physics in 1953. An excellent, more detailed discussion of this process can be found on the Molecular Expressions web-site here. An objective lens with a flatter design than a standard achromat resulting in improved focus around the outside of the field-of-view as well as better resolution and contrast. Typically the best lens design available on a microscope. A technique used to enhance the contrast and image quality on specimen where other techniques such as phase contrast or darkfield are not as effective. Two polarizing filters are used called the 'polarizer' and 'analyzer' filters. The polarizer is placed in the path of the light source, and the analyzer in the optical pathway. A more accurate and detailed description of this process can be found on the Molecular Expressions web-site here. A safety feature consisting of a mechanical stop, usually adjustable, which prevents the objective lens from hitting the microscope stage. A head design where the interpupillary adjustment (increasing or decreasing the distance between the eyepieces) is achieved by twisting the eyepieces in an up and down arc motion like binoculars. A safety device usually located on the focus knob allowing the knob to "slip" and continue turning when it reaches the end of its travel, or if it runs into the stage. Due to the gear ratios involved, without this it may be possible to damage the mechanism by applying too much force to the knob after it has reached the end. A target with a highly accurate scale or other geometry on it used most often for calibrating microscope eyepiece reticles.. Typically a 1" x 3" transparent glass slide with a chrome scale printed on it. It is placed on the microscope 'stage' and viewed just like a specimen. Its scale can then be aligned with the scale on the eyepiece reticle which results in a precise measurement of the microscope's magnification. This then allows the use of the reticle to make accurate dimensional measurements of other specimen. More details on the calibration procedure can be found here. Typically available for use with transmitted light (chrome scale on transparent background) or reflected light (transparent scale on solid background). Also available with N.I.S.T. traceability, meaning the dimensions on the stage micrometer have themselves been calibrated with certified equipment by a certified calibration laboratory. More details on N.I.S.T. traceability can be found here. A microscope with a separate optical channel for each eye (eyepieces and objectives) which allows viewing in three dimensions. Also called a low-power microscope and is used to view larger specimen such as insects, minerals, plants, larger biologicals, etc. See also: compound microscope. An achromatic objective lens that has contrast-enhancing coatings applied resulting in a more detailed, clearer image. The rotatable metal piece into which the microscope's objective lenses are attached. A "turret" style stereo microscope refers to the type that has more than one objective lens which can then be rotated into position. On a compound microscope the turret is the ring holding the objective lenses allowing the operator to rotate them into position as needed. See the picture at the top of this page. A binocular microscope with a third, vertical viewing port. The vertical port can be used with an eyepiece for a second person, such as an instructor, to view the specimen, or it can be used with an adapter and a video or still camera. Click here for an example. See also: dual-view microscope. an eyepiece with an achromatic doublet lens designed in such a way that it does not have to be limited to viewing only in its center, and the portion of the lens that allows non-distorted viewing is larger than a normal lens. This appears to the user as a bigger aperture or "hole" to look through. It therefore has the advantage of being easier to use and more forgiving of a user's head movements. An eyepiece listed as WF10X/18mm would indicate it has a widefield achromatic doublet lens, 10X magnification and has an 18mm diameter aperture.